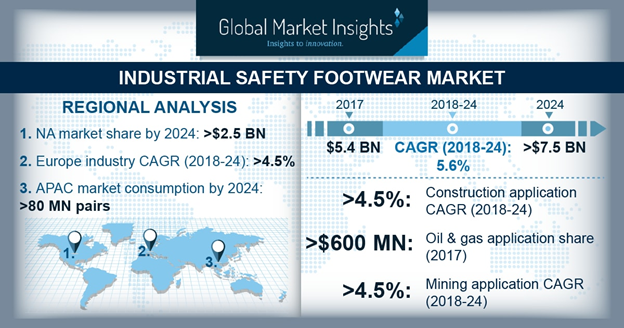 Industrial Safety Footwear Market size is set to surpass USD 7.5 billion by 2024; according to a new research report by Global Market Insights, Inc.
Increasing focus towards workers safety in manufacturing and construction sectors to avoid mishaps may stimulate industrial safety footwear market. Growing construction safety requirements which are driven by increasing number of workplace accidents may influence the adoption of these safety footwears, which may improve occupational protection. Footwear worn in the factory are chosen to avert injuries and hazards which includes contact with rolling objects, stepping on pointed objects, contact with chemical agents and exposure to thermal factors. Conventions and practices regarding worker health & safety concerns including total quality management (TQM) have driven industrial safety footwear demand making it mandatory for industries to fulfill rules regarding workers’ security at workplace. Manufacturers in most of the industrial firms are now becoming proactive regarding workers safety at workplace. Strict regulatory guidelines in the U.S. and UK has been enhancing companies to follow the regulation and rules to evade occupational hazard. As these hazards involve huge losses in terms of work disturbance, costs, legal issues, infrastructure damage and reimbursement to family. Personal protective equipment’s also play a major role in averting these hazards which may stimulate industrial safety shoes market. Polyurethane based industrial safety footwear market size may surpass a consumption of 35 kilo tons by 2024. The shoes outsoles are manufactured from PU as they provide stability which in turn avoid mishaps at the workplace, thereby stimulating the industry demand. Waterproof industrial safety shoes market size was estimated at over USD 390 million in 2017. These shoes are manufactured to protect foot from getting wet when in contact with water and are designed with membrane tape. These shoes are low in price, comfortable due to Gore-Tex patent expiration and improved technology in working with leathers, which may enhance the product growth. Industrial safety footwear from manufacturing application may register substantial gains at over 5.5% by the end of predicted timeframe. The boots should be water and chemical resistant which need special anti-slip and absorbing shocks sole to evade industrial fatalities and its wide application usage in the manufacturing sector. The U.S. industrial safety shoes market growth is anticipated to exceed USD 2 billion by 2024 owing to growing demand for oil & gas, construction, mining, and pharmaceutical industries. These shoes are manufactured in compliance with ANSI and increasing demand for women’s safety shoes, are the driving factors for the market. Rising instances of fatal injuries at the workplace has highlighted the importance of PPE usage substantially in construction, oil & gas, food, transport, and pharmaceutical industries which may enhance product portfolio for industrial safety footwear market. Germany industrial safety shoes market demand should register substantial growth at around 4.5% over the predicted timeframe. Germany is the biggest footwear market in the Western Europe as the country have various independent retailers. In addition, labeling rules are gaining importance in the region as if the material is from endangered plants or animals it must comply with rules of Convention on International Trade in Endangered Species of Wild Fauna and Flora (CITES). Growing animal concern due to sustainability issues should drive textile and leather industries in the region, which in turn stimulate product demand. China industrial safety footwear market size may exceed USD 700 million by the end of foreseeable timeframe. Growing construction sector owing to increasing disposable income and government spending on infrastructural projects may stimulate material demand. Growing demand from European countries and increasing focus on importing to shift sourcing from China to other low-cost producing countries, may drive regional growth. JAL group, COFRA, Simon, W.L Gore and Honeywell International are the key industrial players in the industrial safety footwear market. New product launches and intensive R&D may enhance product portfolio which may further boost industry growth. Most of the producers are now developing new products to increase safety shoes demand which may accelerate industrial safety footwear growth over the forecast timeframe.